There are only a few steps involved in how to make a cupcake cake, and if you've never tried to create one before, it's a fun baking and cupcake decorating exercise that works well for any birthday or party. Cupcake cakes are sometimes called pull-apart cakes, since they're assembled as individual cupcakes that and placed close together and frosted as one unit. These cakes make serving easy, especially for kids, since no cutting or silverware is involved; each guest can simply pull away a single cupcake. There are two types of cupcake cakes. The first, less common variety is a regular-sized cake baked in a giant cupcake pan and frosted to look like a regular cupcake. This type of cake serves as many people as a sheet cake might and is often presented with a variety of smaller cupcakes for decoration purposes. 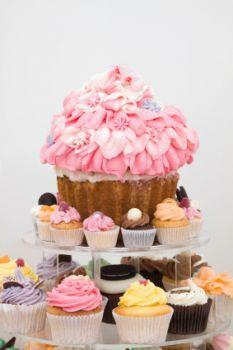 The second, more common type is a flat cupcake cake that's composed of many small cupcakes placed side by side. Frost and decorate these cupcakes as a unit, in the same way as a large sheet cake. The process of how to make a cupcake cake is slightly different depending on which type of cake you're making. Each can be decorated fairly quickly and be presented by itself or as part of larger display. To make a large cupcake cake in a molded pan, make sure you have enough batter to fill both sides of the pan completely. Pour the batter into the pan, and bake as directed. Unmold the two sides of the cake from the pan, and let them cool. To make them easier to frost, you can wrap them in plastic wrap and freeze them for 15-30 minutes before you decorate. Straighten the edges of the two sides with a sharp, serrated knife if necessary. Join the two halves of the cake, fusing them together with frosting adhesive or buttercream. If you'd like, decorate the bottom of the cake with a homemade cupcake wrapper or simple white frosting. Frost the top of the cake with a flat spatula and buttercream frosting. Decorate with small candies, dragées, or other accessories. To make a flat cupcake cake, use a thick frosting such as buttercream. 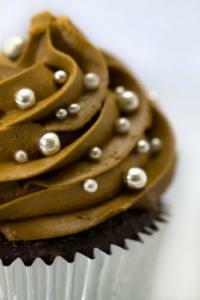 Fondant, ganache, and other types of frosting are less likely to spread evenly over the cake. Bake the number of cupcakes you need to assemble your cake. Let them cool, but do not unwrap them. To make the cake easier to frost, you can wrap the cupcakes in plastic wrap and freeze them for 15-30 minutes. Arrange the cupcakes on a stiff, strong piece of cardboard or on a sheet cake board in the pattern you want. The cupcakes may be easier to frost if you place them in diagonals or a diamond pattern rather than side-by-side. Spread the frosting with a large wide tip and a pastry bag. Even out the frosting with a flat spatula. If you'd like, you can also frost the cupcakes individually and then stick them together in the pattern you want, or make individual swirls on each cupcake. That method works best for cakes with some texture to the frosting. When you've piped and smoothed the frosting, decorate the cake as usual, and serve on the cake board. 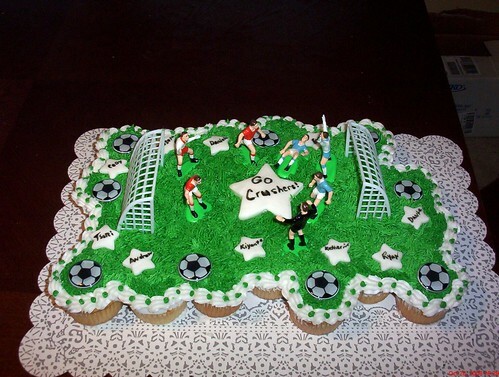 A cupcake cake is as unusual cake design that is sure to please any crowd hungry for some sweets.